A blond boy’s own adventure, the fictionalized true-tale “Kon-Tiki” charts what sounds like, at least on paper, a remarkable journey. 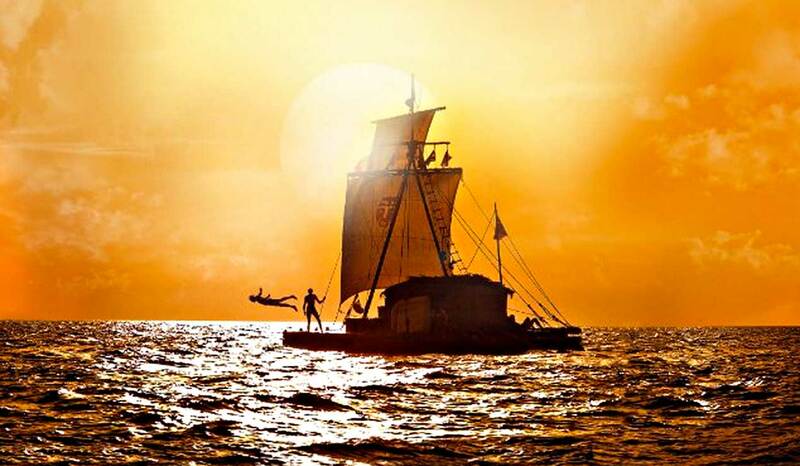 In 1947, a Norwegian zoologist and adventurer, Thor Heyerdahl (Pal Sverre Hagen), set sail for Polynesia from Peru in a balsa-wood raft that he called Kon-Tiki, after a sun god. Heyerdahl (1914-2002) had lived in Polynesia in the late 1930s, and through his studies had developed some unorthodox ideas about early migrations to the islands. Unlike other researchers, who embraced the theory that Polynesia had been populated by way of Asia, Heyerdahl argued that the islanders originated in South America. To prove his theory, and apparently advance his reputation in an overwhelmingly skeptical, unsympathetic professional world, Heyerdahl built the kind of raft that he believed early South American seafarers might have constructed. He then set sail with five other men, four Norwegians and a Swede, who in the movie register as more or less indistinguishable sunburned blonds. After 101 days they landed on the Raroia Atoll in the Tuamotu Archipelago. Thereafter, Heyerdahl became a media star: his book, “The Kon-Tiki Expedition,” was translated into multiple languages and a 1950 documentary about the expedition won an Oscar. He went on to other adventures, which are documented at the helpful Web site for the Kon-Tiki Museum in Oslo. Whether he was right about his early explorers is a question best left to anthropologists, and one that is not seriously engaged in the movie. In the 2009 book “The Wayfinders: Why Ancient Wisdom Matters in the Modern World,” the anthropologist Wade Davis writes that Heyerdahl “inverted history itself” with his claims about the Polynesian migration. “In making his sensational claim,” Mr. Davis writes, “Thor Heyerdahl ignored the overwhelming body of linguistic, ethnographic and ethnobotanical evidence, augmented today by genetic and archaeological data, indicating that he was patently wrong.” That sounds like grounds for another kind of film, one that would necessarily take a less heroic, more complex approach toward science, its uses and possible abuses.